While Filipinos are keeping a close track of everything that has been going on in the local election race, ABS-CBN Global reporters have been keeping us abreast with all the latest in the U.S. presidential race. 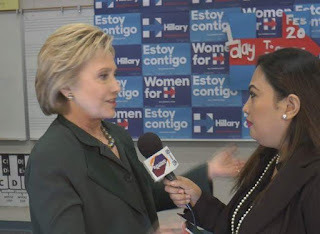 Bev Llorente recently caught up with Democratic presidential candidate Hillary Clinton for an exclusive interview, in which she talked about how she will involve Filipino-Americans in her administration as well as her take on the Philippines' territorial dispute with China. Touting herself as an advocate for Filipino-Americans, Clinton said: "I was one of the senators who worked hard to make sure that Filipino war veterans got the benefits that they have earned and had not yet been delivered to them. And I want to take a hard look how we can expedite family reunification. That should be our highest priority — we need comprehensive immigration reform, take care of the people who are here and as part of that we need to expediting family reunification for people who have been waiting in line in order to get rid of that backlog." When asked whether she will involve Asian-Americans in her administration, she said: "I'm so proud to have so much support from Asian-Americans because I feel strongly that this a community that needs to be at the table. The contributions you've made, the work that you have done, needs to be recognized. I intend to have an administration that really does include a lot of Asian-Americans and I've worked with so many Filipino-Americans over the years, have so many friends, know so many people that I am confident we're going to have a good representation from the Filipino-American community too." Clinton, who served as secretary of state under the Obama administration from 2009-2013, said she strongly supports the Philippines in its territorial dispute with China, saying she is proud of the country for taking the case to the international court. "I thought that was a very wise decision because there should not be any seizure of any territory until there is some kind of resolution that is legal," she said. "I have supported the Filipino government in taking the action that they have in the courts and I have visited the Philippines when I was secretary of state to show my support... for them to be able to protect their coastline and their possessions — the territories that the Philippines claim."